in The Netherlands and Flanders. The most comprehensive digital overview of 266 bees (species or genus) in The Netherlands and Flanders. More than 56% of the species found in The Netherlands (in total 358) are endangered and on the Dutch Red List (RL). Public awareness of this situation is urgently needed. Almost 80% of the beespecies are to be considered as potential pollinators of agricultural crop in The Netherlands. 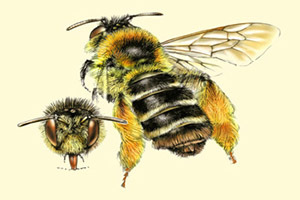 Select on bee-genus and go further to the species menu. Or use the search-page. Also very usefull: the calendar.